Well done Kilmarnock, halving their ticket allocation to R**gers, by giving them only one stand. They said they want to create a family atmosphere. 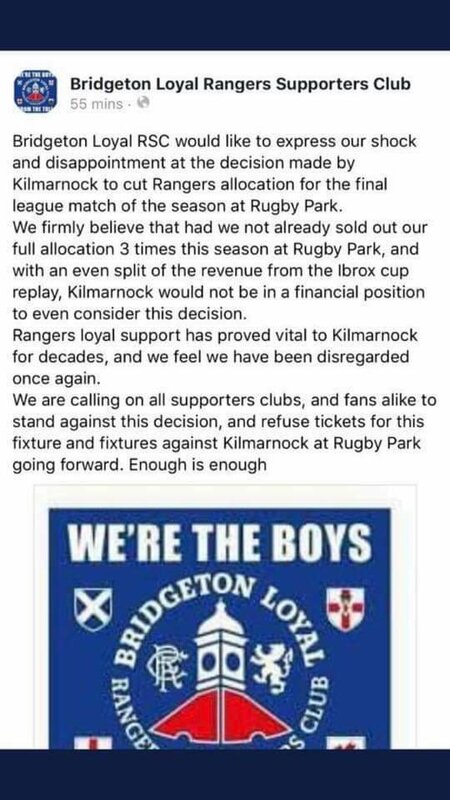 It's because this game is important to them and they don't want to give Rangers the extra advantage that letting them have the majority of the crowd brings rather than to create a family atmosphere, Killie want an antagonistic atmosphere with a large home crowd behind them. An added bonus is the social media outrage being expressed by Newco supporters. It's also Killies 150th anniversary and they want to celebrate it with their own fans.Hope they sell it out. sevco are now trying to bully killie by saying if they only get 1 stand then that's all they'll take in the future.Who do they think they are?Time they died again. Always a pleasure to enjoy the seeth that eminates from the Sevconians. In the days when no one was watching Rangers, the away sides at Ibrox used to get the whole of the Broomloan Rear to themselves, whether they could fill it or not. Then people started watching Rangers, so they gave the seats to their own fans instead. I'm not sure what's different here. So much for there constant chanting of "no one likes us we don't care"
Just shows you how much he thinks of his old club and I'm not talking about that shower along the M8. Wasn't he our Assisstant Manager when we got relegated in 91/92? He has either been misquoted or he has accidentally said the wrong thing. He cna't possibly mean what he said. No sane person would have said that. He definitely said it in the context it was reported in but I see he's taken the comment back today and pretended he never said it. So at least he knows he f**ked it. Seems similar to some of the comments Strachan has came away with in the last few years (genetics, racist thing). These guys are getting old and sometimes outrageous and nonsensical comments slip out which they need to take back immediately. He surely cant have meant it. Seems similar to some of the comments Strachan has came away with in the last few years (generics, racist thing). These guys are getting old and sometimes outrageous and nonsensical comments slip out which they need to take back immediately. He surely cant have meant it. No I'm pretty sure none of these guys actually mean what they say. It's pretty clear that a number of these ex-stars are losing their mental faculties. Joking aside, it's shocking to see. And people wonder why Scottish football is in a bit of a state. Ex SFA chief coming out with drivel like that ffs. Is this the same club that limited every visiting team to a corner of their stadium this season? When a club was recently founded in the Govan area, a prominent supporter of a previous club that once used the same venue called for the supporters of the new club to boycott attending Dundee Utd. First game the new club played there, you'll never guess who was there.